*This article was originally posted on the DH Blog. Visit the original article here. *For more information on the Digital Humanities visit here. 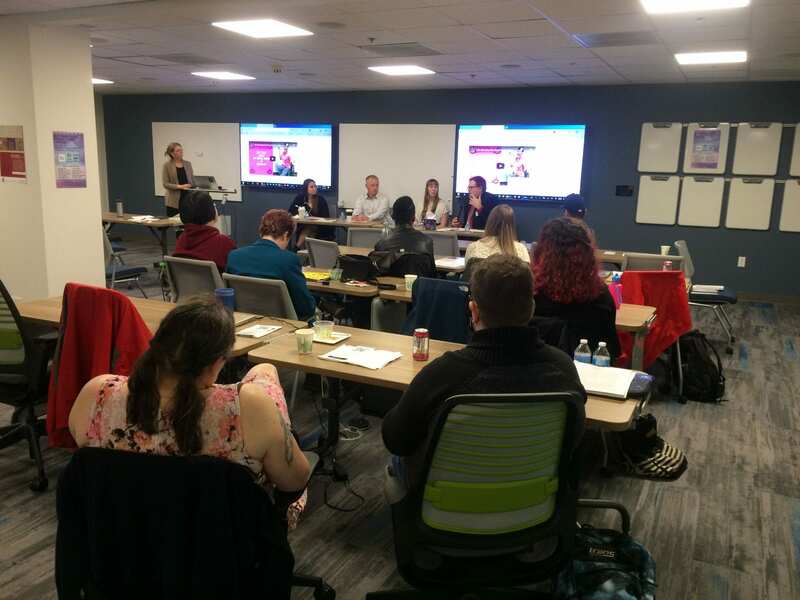 Last Friday, April 5, a group of graduate students, faculty, and members of our community came together for the first Data/Media/Digital Graduate Symposium. The symposium showcased research projects developed by twelve UO graduate students whose work covered an impressive range of data, digital, and media methodologies and subjects. The event was such a success that we couldn’t miss this opportunity to share it here on the blog. 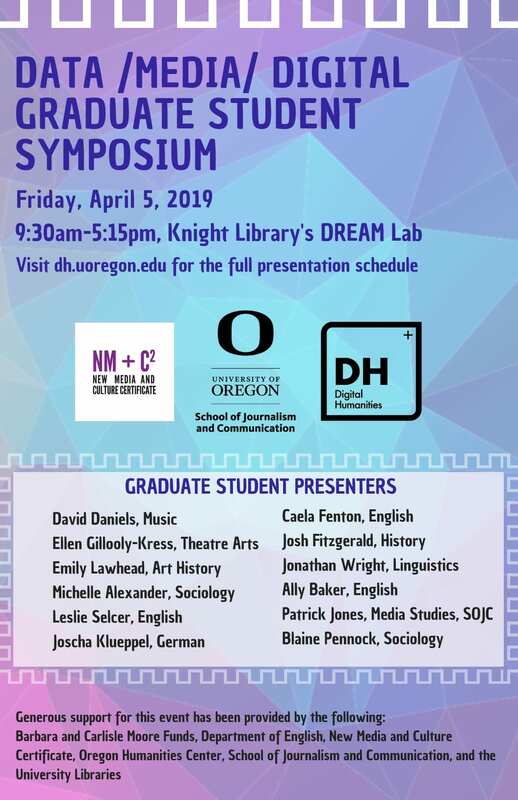 Friday’s symposium was co-hosted by DH@UO, the New Media and Culture Certificate, and the School of Journalism and Communication. It was held in Knight Library’s new DREAM Lab, which is a collaborative space for students and professors working on digital projects. The symposium’s call for proposals drew masters and PhD students from nine different departments including Music, English, the School of Journalism and Communication, History, Sociology, Linguistics, German, Theatre Arts, and Art History. Despite the range of disciplines and topics, the presentations still fit seamlessly into three panels: Experience and Interface; New Media Identities/Subjectivities; and Digital Curation, Exhibition, and Sharing. 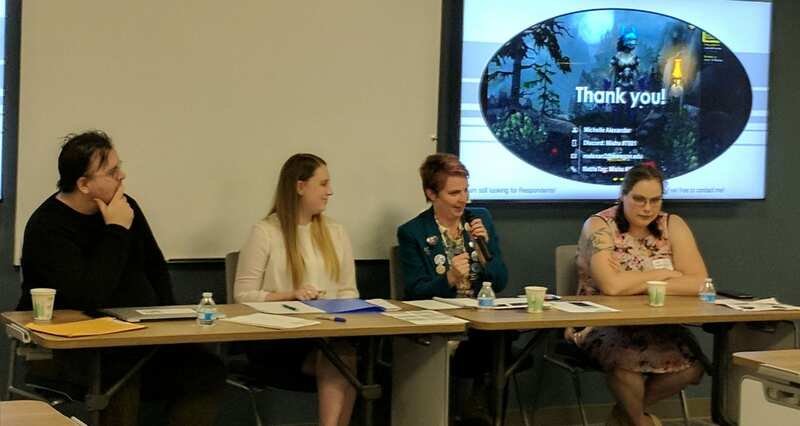 The first session, “Experience and Interface,” included presentations from David Daniels (Music), Ellen Gillooly-Kress (Theatre Arts), Emily Lawhead (Art History), and Michelle Alexander (Sociology) and was chaired by Professor Bish Sen of the School of Journalism and Communication. All four of the presenters explored various spaces and digital tools, which included art installations, the theatre, playing World of Warcraft and Dungeons and Dragons, and computer vision software that allows the user to make musical sounds with their facial expressions. Each presenter engaged with questions about how media tools and technologies shape human encounters both with one another and with those tools. At the same time, they raised important considerations about the intersection of art and music with media and technology. After a group lunch at Falling Sky, Leslie Selcer (English), Joscha Klueppel (German), Blaine Pennock (Sociology), and Patrick Jones (Media Studies, SOJC) coalesced around the second panel, New Media Identities and Subjectivities. This second panel debated the complexities of online authorship, performance, and reception (or how they are interpreted by others online and in social media). After the presentations, Professor Colin Koopman and the panelists led a discussion on the topic of online identity and questions of authenticity. While platforms like YouTube, Facebook, and Instagram seem to create a stark divide between our authentic selves and our online identities, many of the panelists argued that this line is actually more blurred than we may realize. The third panel discusses digital curation. Photograph by Hayley Brazier. The third panel—Digital Curation, Exhibition, and Sharing—was the last of the day and included presentations by Caela Fenton (English), Josh Fitzgerald (History), Jonathan Wright (Linguistics), and Ally Baker (English). All of the presenters in this panel have been developing online projects to showcase their research and graduate student work. Panel chair Professor Heidi Kaufman facilitated a discussion between the panelists and the audience focused on the politics of online archives and collections. Panelists addressed questions about the possibilities and limits of design and content: What materials should be made available online? How does copyright prohibit the sharing of certain text or images? Why is curation so important to a successful scholarly project? It was clear at the end of the symposium that a growing field of UO graduate students are using data, media, and digital studies to advance questions raised by their research.These fields have been growing in academic culture, and the Symposium created an opportunity to assess future directions and shared areas of interest among our graduate students. Based on this year’s success, we hope the Data/Media/Digital Graduate Symposium will continue. 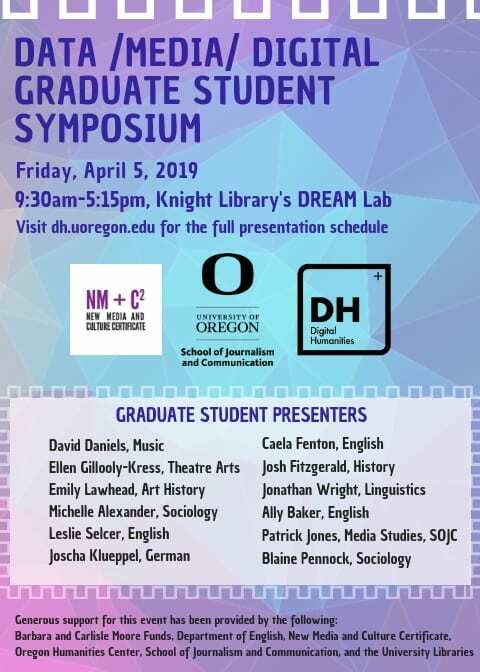 This year’s symposium was made possible by a generous support from the Barbara and Carlisle Moore Funds, Department of English, New Media and Cultural Certificate, Oregon Humanities Center, School of Journalism and Communication, and UO Libraries. And a special thanks to Franny Gaede for all of her help in preparing for the symposium! What is Technology? (2019) will examine interactions and transactions among practical arts and tools, techniques and processes, moral knowledge and imagination, to navigate our everchanging world. In a broad sense, technology can be understood as methods of intelligent inquiry and problem-solving into all domains of life. The conference-experience will enact a collaborative network of transdisciplinary research by cultivating information and communication as the heart of science, technology, engineering, art, medicine, and environments. This year marks the ten-year anniversary and ninth annual What is…?, bringing together natural and social scientists, scholars, government officials, industry professionals, artists and designers, as well as alumni, students, community organizations, and the public. We invite proposals for scholarly papers, panels, and installations on a wide variety of issues and topics. Please see whatis.uoregon.edu for additional details. For a complete schedule see the full conference schedule here. Machine learning is a field characterized by development of algorithms that are implemented in software and run on a machine (e.g., computer, mobile device, etc.). Each such algorithm is characterized by a set of parameters, and particular parameter settings yield associated algorithm characteristics. The algorithms have the capacity to learn, based on observed data. By “learn” it is meant that the algorithm can infer (or learn) which algorithm parameter settings are best matched to the data of interest. After algorithm parameters are so learned, the associated model ideally captures the underlying characteristics of the data. The algorithm, with learned parameters, may subsequently be applied to new data, with the goal of making predictions or learning insights. Machine learning methodology is primarily concerned with designing appropriate models/algorithms for datasets and problems of interest, plus the capacity to learn the model parameters given data (with challenges manifested when that data is of a massive scale). 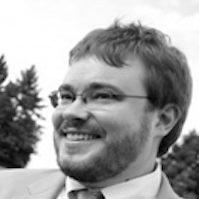 Please join us for Jake Metcalf’s tech talk, entitled “Moral Ontologies of Machine Learning and the Problem of Domain Skipping,” on Thursdsay April 25th at 3 PM in the Knight Browsing Room. Jake will also participate in a day-long event, entitled “Neuroscience, Ethics, & Law in an Era of Big Data,” in the Knight Law School (141) on Friday April 26th. Jacob (Jake) Metcalf is a data ethics researcher and consultant, focused on the adapting the conceptual frameworks, policies and institutional practices of research ethics to the methods of data science and machine learning. He is a Researcher at Data & Society where he is a co-PI on the PERVADE research team and the co-founder of the technology ethics consulting firm, Ethical Resolve. For more on the specifics of his talk for the NMCC, see the abstract below. Abstract: One of the primary patterns we see in AI/ML ethics is that the technical/mathematical structures behind ML cause algorithms to jump domains in a way that causes trouble for our lived experience. A machine doesn’t know the difference between health and consumer data, and ML will always seek to bundle everything under a single, flattened ontology. However, we experience moral problems as having a topology — we experience shopping and doctors notes a meaningfully different and expect computers to respect that. Join Dr. John Durham Peters, Professor of Film and Media Studies at Yale University,for a public talk entitled entitled “How the Modern World Lost Interest in the Weather: A Media History” at Reed University in Portland on Monday March 18th at 4:30 P.M. The talk will be in Eliot 314 on Reed’s Campus. The address is 3203 SE Woodstock Blvd, Portland, OR 97202. Description: On its face, weather sounds like the most banal and mundane thing possible. When people talk about the weather, we usually take that as a sign of nothing to talk about. This talk aims to show that the accusation that talking about the weather is intellectually empty is hardly the case in the age of climate change, and even dangerous. Reading the skies is one paradigm case of human-nature interaction, and studying weather can stand in as part for whole as an inquiry into the environments humans have made or unmade. The history of modern weather forecasting is also a history of the militarization of the sky and oceans, and is co-extensive with the history of modern telecommunications and computation. Join us on March 7th from 4-5:30pm in the Knight Library DREAM Lab to celebrate the launch of the digital scholarship project Red Thread. Experience the story of the color red situated within global  perspectives that tell stories about objects from UO Libraries, Jordan Schnitzer Museum of Art, and UO Museum of Natural and Cultural History contextualized by student research essays from Dr. Vera Keller’s course Global History of Color, 1400-1900, faculty research writings, and map visualization. 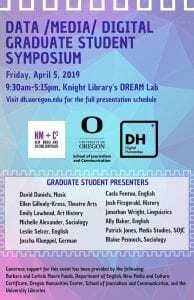 Demos and rare book display from UO Libraries Special Collections and University Archives, UO Libraries Beach Conversation Lab, and UO Craft Center will be available to experience and students from the course will be on hand to talk about their research. UO Libraries’ Digital Scholarship Center Faculty Grants Program, Oregon Humanities Center’s Endowment for Public Outreach in the Arts, Sciences, and Humanities, UO Department of History. A quick update on a new course being taught by NMCC Director Colin Koopman. I’m now in my second year as Director of NMCC and I’m very happy to announce a new graduate course on media archaeology and media genealogy I’ll be teaching in Spring of 2020 (note the year, not this coming term, but in a year from now). From Archaeology to Media Genealogy will be a graduate offering focusing on the canonical work of media archaeologists such as Friedrich Kittler, Cornelia Vismann, and Wolfgang Ernst (as well as other figures of the ‘German School of Media Archaeology’). We will then explore recent work moving toward media genealogy, some of which was announced in a recent special section on Media Genealogy at the International Journal of Communications. All of this will take place against the trajectory of the work of Michel Foucault, and his own movement from philosophical archaeology to philosophical genealogy, though no prior knowledge of Foucault will be expected. The course will be offered through the Philosophy Department and will be open to graduate students of any major. The course will be focused primarily on theory and history, but I have expansive conceptions of both of these. I’d love (!) to have NMCC students from any discipline in this course and in fact you all are the reason I am teaching this. If you have any questions, please email me at koopman@uoregon.edu. The position include basic research as requested, creating, filing, archiving, organizing and otherwise managing electronic content, including documents, photographs, files and folders; use and management of Excel files and databases, communications support (i.e. emails to faculty); meeting and event staffing and support; proofreading and fact-checking, and other duties as assigned. Applicants should send their materials (standard GE application and one page cover letter) to the casdean@uoregon.edu inbox by March 1.